Susana Gonzalez is a latin actress who was once hypnotized on TV by Mexican Hypnotist Niko, whose bigger claim to fame has been recently hypnotizing several players from the Mexican Soccer Team in preparation for the next World Cup. Here in the Society we have always admired Niko for his excellent taste in choosing classy hypnosis subjects.. The video of Susana hypnotized and made stiff as a board has been available for a long time as part of Hypnovideo's absolutely essential Ladies of Spain compilations (if you like this blog and don't have any of these DVDs you are missing a lot of good things; go and get them). However, it was not available in full, as the beginning of the sequence was missing. Now Niko has uploaded the full video to his site, including a rather nice fast induction that shows that Susana is a pretty good subject. The format of the file is horrible Flash that we cannot grab and upload somewhere else, but it's definitely worthy of your time. Go and have a look. 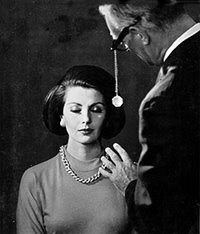 Remember that we are always looking here for new or old fascinating files about glamour, beauty and hypnosis. If you come across something interesting in your travels through the web, or you want to contribute with some rare item from your personal collection please let us know. The Tara Palmer bit is lovely, but far too short. I wish the unedited version were available. I haven't actually watched the clip posted, 'cos I saw and recorded this at the time it was broadcast, but just to assure you canuck, it was a very short little segment of the programme, so probably what's been featured here is all that there actually is to see. I actually got rid of my recording (I've wiped off most of my stuff which features McKenna actually...most of the time I find his manner very, very hard to stomach ;)). You have a great blog. Please feel free to check out my site subliminal messages and leave me your opinion on it. What has happened to this blog? It's a great site, I would love to see more updates! I hope this isn't the end. I sent a list of my own clips to share via e-mail, did you recieve it? This is not an easy thing to get your popular and full of charm hermes , each packet not only takes you from range, but need to wait several years for most of the time. Because each hermes watch is hand-made chef, a Hermes Jewellery of the completion time of 3 months, so, usually ordered after at least 6 months to 1 year before taking the arrival. Chanel handbag is a big and old brand name in not only purses but also perfumes, shoes, watches, jewels and cloth lines. Owning Chanel means owning luxury. chanel watches is known to rope big names as spokes model during the innumerable campaigns- to launch its products periodically. I don’t care who you are, where are you from I am just sure when you are wearing Tiffany and co favorite Tiffany rings your outer appearance, social identity and even your whole life will make changes. Your whole body has unconsciously thrown off a unique flavor of Tiffany necklaces and nobleness. I just need you trust me, buy Tiffany accessories your life is happy. It's actually a nice and useful piece of info. I am satisfied that you simply shared this helpful information with us. Please keep us informed like this. Thank you for sharing. Thіs аrtіcle is genuinely a fastidiouѕ onе it helps new internet userѕ, who are wishing for blogging. Utilizing flex belt brings along with it a quantity of benefits that cannot be overlooked. and 1 include on functions offer.